We’re used to mobile applications supporting various types of interactions such as sliding gestures to select, or to drag and drop. What we tend to forget is that there is a growing trend toward unifying the user experience across platforms. In the early days, iOS and Android each had their own unique feel, but recently they have been growing closer together in terms of the way applications are designed and interactions happen. With bottom navigation and split screen features now available in Android Nougat, Android has a lot in common with iOS these days. For designers, this coalescing of design languages means that we can often adjust popular features that were once associated with one platform for apps designed for the other. Recently, to keep up with the trend of merging design styles across platforms, we worked on an Android animation that is inspired by the popular bubble animation in Apple music. Our task was to develop an interface that was easy enough for novice users but that still felt interesting for more experienced users. 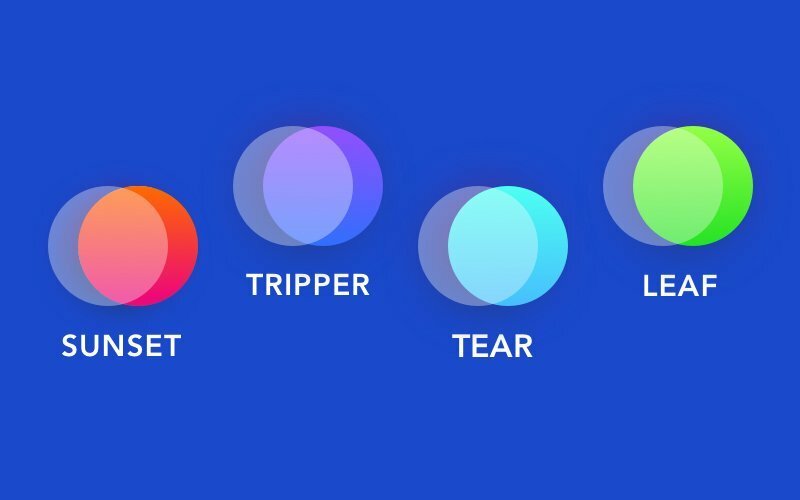 Our vibrant BubblePicker is a great way to make an app more content-focused, original, and fun. Google is rolling out their “Material Design” language across all their products, but nevertheless, we decided to experiment with bold colors and gradients this time around to add more depth and volume to the image. Gradients might be the major visual in the display and might attract the attention of new visitors. Our component has a white background with lots of bright colors and graphics against it. This high contrast is very helpful for apps rich in content, where users have to choose from a list of options. For example, in our concept we used bubbles to hold the names of potential destinations within a travel app. Bubbles float freely, and when a user taps on one of them, the tapped bubble grows in size. Moreover, we provide developers with the opportunity to customize the elements of the screen to make the animation suit any app. It became clear to us that rendering such a fast animation on Canvas wouldn’t be efficient enough, so we decided to use OpenGL (Open Graphics Library). OpenGL is a cross-platform application programming interface for 2D and 3D graphics rendering. Fortunately, Android supports some versions of OpenGL. We needed to make our circles move naturally, just as gas bubbles do in a fizzy drink. There are plenty of physics engines available for Android, but we had specific requirements that made it significantly more difficult to make a choice: the engine needed to be lightweight and easy to embed in the Android library. Most engines are developed for games and require you to adapt the project structure to them. After some research we found JBox2D (a Java port of the Box2D engine written in C++); and since our animation isn’t supposed to be used with a great number of physical bodies (in other words it’s not designed for 200 or more objects) we could get away with using a Java port instead of the original engine. Also, later in this article we’ll explain our choice of programming language (Kotlin) and talk about the advantages of this new language.To find out more about the difference between Java and Kotlin you can read our review in our previous article. To begin with, it’s important to understand that the building block in OpenGL is a triangle since it’s the simplest shape that can approximate other shapes. Any shape that you create in OpenGL will consist of one or more triangles. 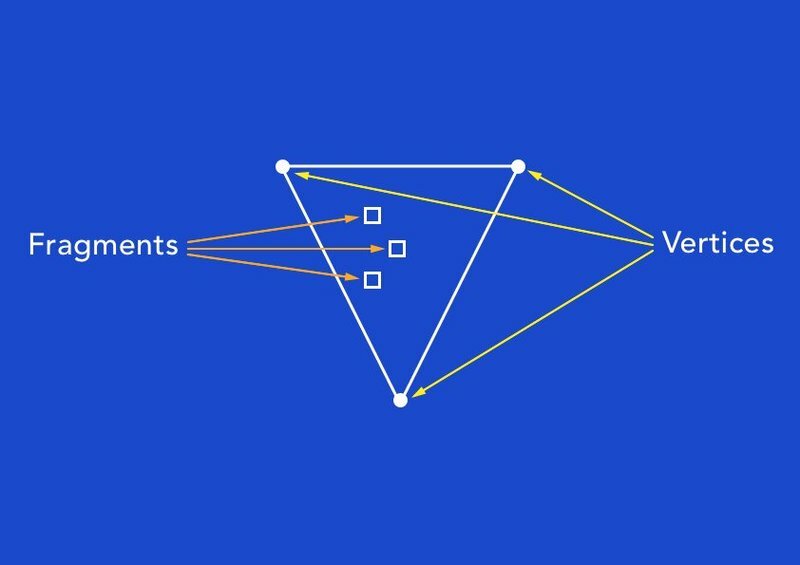 To implement our animation we used two combined triangles for every body, so it looks like a square, where I can draw the circle. To render a shape you need to write at least two shaders – a vertex shader and a fragment shader. The difference between these two is evident by their names. A vertex shader is executed for each vertex of each triangle, while a fragment shader is executed for every pixel-sized part of the triangles. Shaders are written in GLSL (OpenGL Shading Language) and must be compiled at runtime. If you code in Java, the most convenient way to do that is to write your shaders in a separate file and retrieve them using an input stream. As you can see, Kotlin lets developers create shaders in classes more conveniently by putting any multiline code in triple quotes ("""). 1. To find out the distance between the current fragment and the center of the square; depending on this distance, we can change the color of the fragment to draw a circle. 2. To properly place the texture (the photo and the name of the country) in the center of a shape. The a_UV variable contains x and y values that are different for each vertex and which lie between 0 and 1. In the vertex shader, we just pass the value of the a_UV variable to the v_UV variable, so the v_UV variable can be interpolated for every fragment. 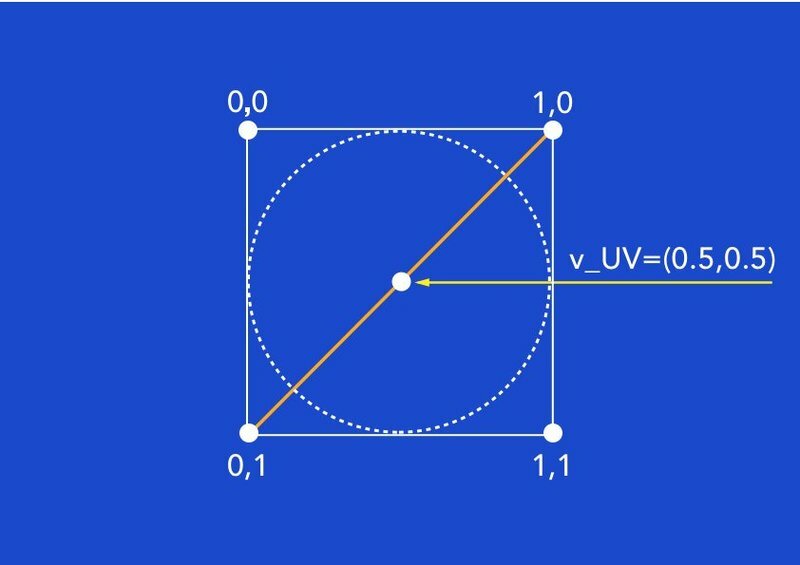 As a result, the v_UV variable for a fragment in the center of a shape will contain the value [0.5, 0.5]. To figure out the distance between the picked fragment and the center we use the distance() method. This method uses two points as a parameter. Every circle in this animation has two states – normal and selected. In the normal state, the texture of a circle contains text and color; in the selected state, the texture also contains an image. So for every circle we needed to create two different textures. After doing this, we pass the texture unit to the u_Text variable. To get the actual color of a fragment we use the texture2D() method, which receives the texture unit and the position of the fragment respective to its vertices. As we can see, it’s easy to create the body: we simply need to specify the body type (e.g dynamic, static, kinematic), and its position, radius, shape, density, and fixture. Every time the surface is being drawn, it’s necessary to call the step() method of the World instance to move all the bodies. After that we can draw all shapes at their new positions. 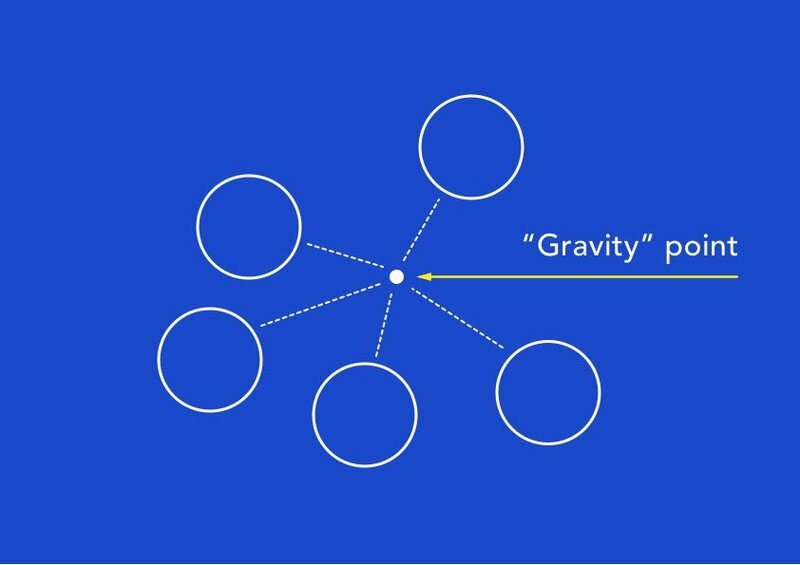 Every time the world moves, we calculate the appropriate force and apply it to each body, making it look like the circles are affected by a gravitation force. When a user swipes the screen, we increase the gravity and change its center, so for the user it looks like they are controlling the movements of the bubbles. When the user stops swiping, we return the bubbles to their initial state. When we find the selected circle, we change its radius, density, and texture. This is the first version of our Bubble Picker, and we surely plan to develop it further. We'd like to give other developers the possibility to customize the physical behavior of bubbles and specify urls to add images to the animation. We also want to add some new features such as the ability to remove bubbles. Check out our BubblePicker animation on GitHub and BubblePicker on Dribbble.